Satellite estimates of solar radiation at the hourly scale depend on the spatial and temporal variability of solar radiation within a region. To examine this effect, a field program was established near Badajoz, Spain (38.88°N, 7.01°W) consisting in deployment of seven pyranometers at or adjoining the Meteosat pixel for the area. A simple semiempirical retrieval approach based on the satellite reflectance was developed using data from one pyranometer station at the University campus and subsequently tested with an independent data set for the same station. The accuracy of the satellite estimate is a strong function of the averaging period and the frequency of satellite scans used. At the hourly scale, best estimates of solar irradiance are obtained with satellite data taken every 5 min, giving a coefficient of determination (R2) of 0.883. 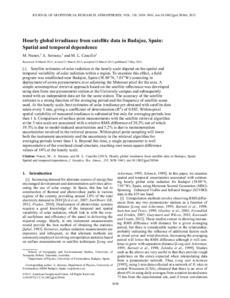 Within-pixel spatial variability of measured irradiance is substantial but only for averaging periods less than 1 h. Comparison of surface point measurements with the satellite retrieval algorithm at the 5 min scale are associated with a relative RMS difference of 20.2% out of which 19.5% is due to model-induced uncertainties and 5.2% is due to instrumentation uncertainties involved in the retrieval process. Within-pixel point sampling will lower both the instrument uncertainty and the uncertainty in the retrieval algorithm for averaging periods lower than 1 h. Beyond this time, a single pyranometer is well representative of the overhead cloud structure, reaching root mean square difference values of 14% at the hourly scale.